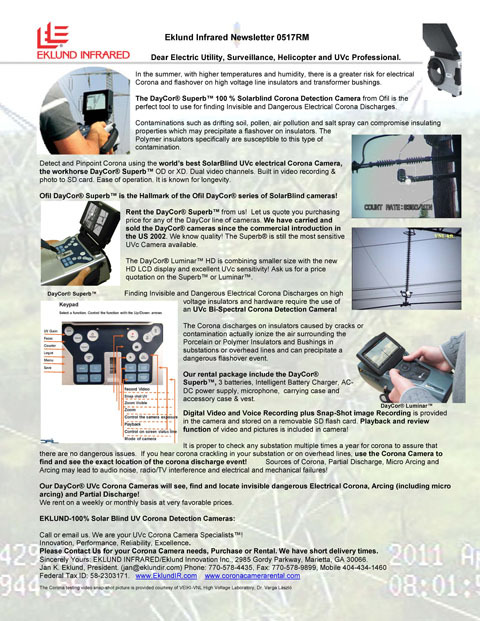 Please click on the newsletter picture below for a PDF copy of our latest 2019 Corona Camera Newsletter! 2018 and earlier are availanble below! 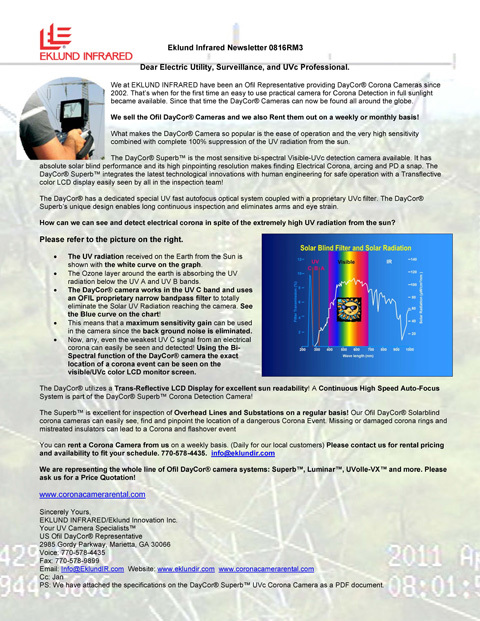 Eklund Infrared is your Representative for the Solar-Blind DayCor® Corona Camera line from OFIL Ltd. 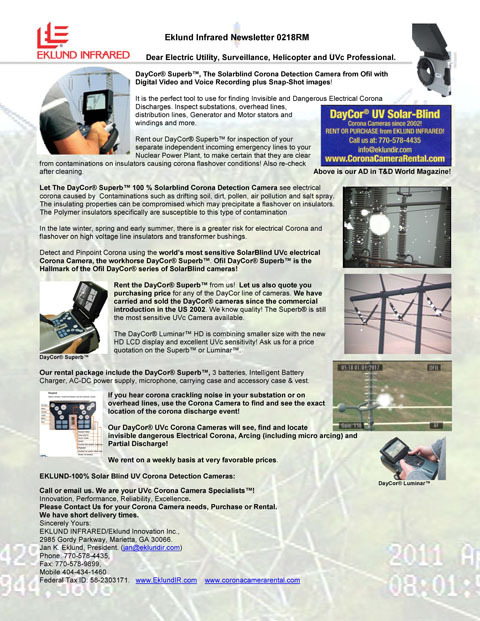 Please contact us for price and delivery on DayCor® UVc Solarblind Corona Detection Cameras. 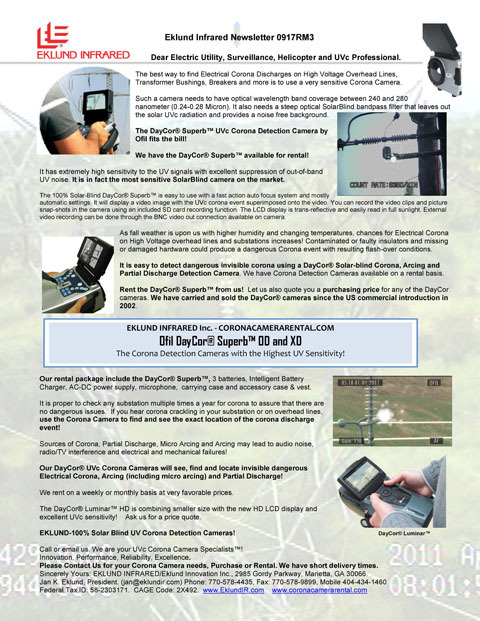 We at EKLUND are representing Ofil since 2002 and have a vast experience in Electrical Corona Detection. 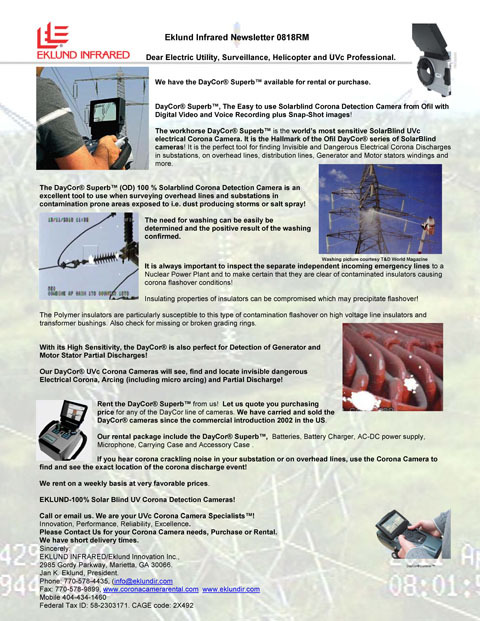 For our Rental Customers, we are your supplier of the DayCor® Corona Rental Cameras. 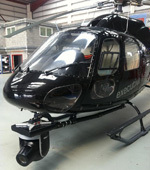 We provide rental cameras on a weekly basis. Longer rental periods are available! We can provide daily rentals for our customers in the general Atlanta, GA Area. Please contact us for pricing and availability! The DayCor® Superb™, the OFIL Flagship Camera, is one of the most popular Corona Cameras ever. 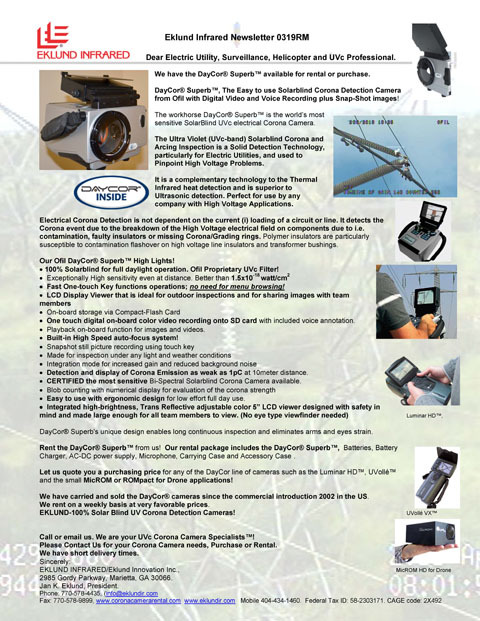 Purchase any the OFIL DayCor® Corona Cameras, including the Luminar™ and UVolle-X, from us. Ask us for a current Price Quotation for any of our cameras FOB your destination! Check with us for more information on the new Ofil Reporting software “CoronaWise”! 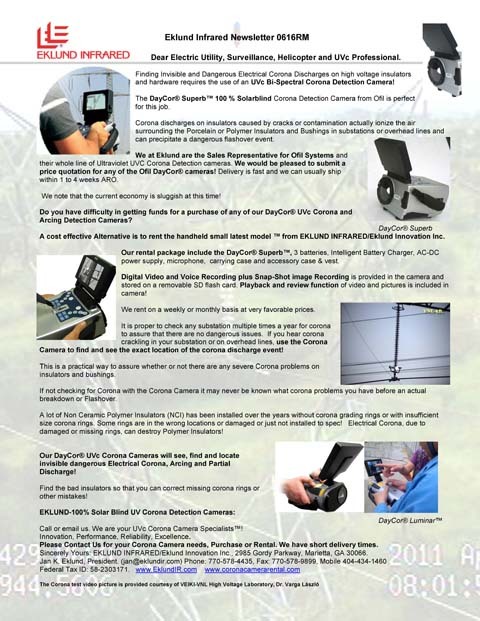 Please click on the newsletter pictures below for a PDF copy of our 2016 Corona Camera Newsletter! 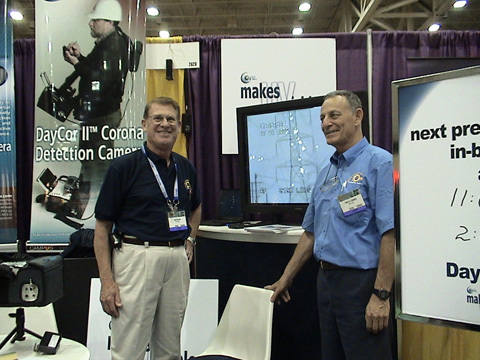 Above: Jan Eklund and OFIL Company Co-Founder Dr. Pinhas Lindner at IEEE PES Exhibit, 2006, Dallas Texas! 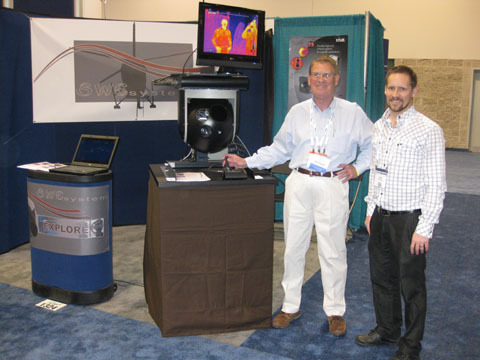 Eklund Infrared has been your US representative for SweSystem since 2007. Eklund Infrared/Eklund Innovation Inc. is a 100% American owned company. All employees are citizens of the USA. 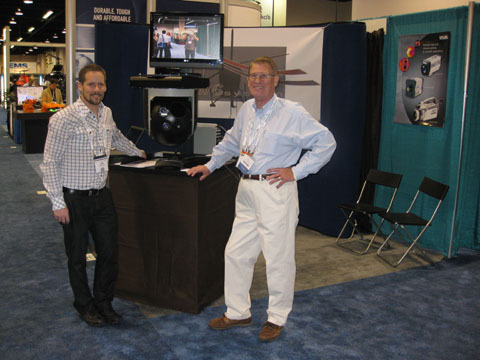 The controlling interest in Eklund Infrared/Eklund Innovation Inc. is American and is located in the USA. Home Contact Us © Copyright 2000-2019 by EKLUND INFRARED. All registered Trademarks and trade names are acknowledged to be the property of their owners.